Last week, at our annual Living With Christ dinner and lecture, it was snowing hard. It was snowing really hard: huge gusts of wind, thick heavy flakes falling to blanket the streets with wet slush. And I am astounded and grateful that people came out anyways, braving the traffic from places like Oakville and Brampton to get to the church. From everyone in the pews to Father Mallon himself, the dedication people displayed is amazing. But then, “armed with these convictions, we were launched into the brick wall of parish life at a hundred miles per hour. It was not pretty.” Father Mallon explains that while personal holiness was only naturally expected from a priest, it had nothing to do with the average everyday Catholic who sat in the pews on Sunday and then left. Orthodoxy didn’t touch or inspire a young, questioning, post-modern audience. There was no real connection from the Church to the churchgoer, and from each churchgoer to each other. So how do churches make those connections? What Father Mallon offers is a template that “places high value on hospitality, great music, amazing and relevant talks, and a transformative experience of community in small groups.” He emphasizes reaching out to people and welcoming the stranger, forming a parish that is in and of the local community. This doesn’t mean abandoning Catholic orthodoxy, or personal holiness: rather, it means making people feel comfortable enough in a church to be open, to speak their minds and to listen and learn. This becomes the touchstone for personal spirituality, for the ‘strong conversion moment’ that Father Mallon speaks of above. 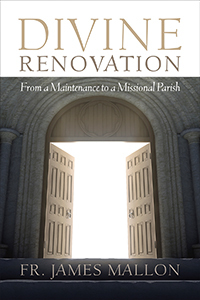 Divine Renovation is an interesting read for all Catholics—especially those who attend church dutifully but not enthusiastically. If each Catholic is part of the body of the Church, and carries the Church within them, then the work of renewal and mission belongs to all of us.